If one considers the line ‘Daag Achhe Hain’ the recall would more than likely lead to Surf Excel. 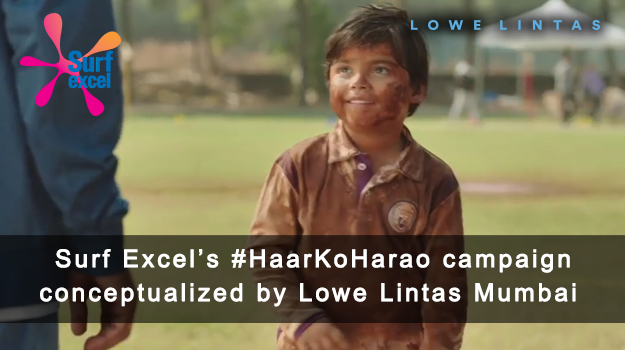 The washing powder brand is back with a new TVC under the same theme, ‘Daag Achhe Hain – #HaarKoHarao’. The ad has been conceptualised by Lowe Lintas Mumbai, directed by Vinil Mathew and produced by Breathless Films. The ad begins with a coach addressing a kid’s cricket team about yet another loss and out of frustration and disappointment, he wants to quit. Hearing this, one of the children goes to the centre of the ground and starts destroying the pitch by rubbing his clothes all over the chalk lines, hosing it down with water and struggling to use the large roller. In the process, he soils his uniform completely. Seeing his behaviour escalate, the coach rushes to him asking him what he’s doing, to which the child responds that he’s frustrated too since they lost the match. The twist in the ad as is that the coach tries to convince the child that it’s not the last match so he shouldn’t get so upset and the child asks that if that were true, then why would the coach quit. The child continues to say that if they lost that day, they could still win the next. This leaves the coach speechless for a few seconds before he puts his coaching cap back on and asks the little boy to come in for practice at 5.30am the next day. The brand had uploaded the one and a half minute-long digital film on YouTube on November 30 and started advertising on TV with a shorter duration film (45 seconds) from December 01. The campaign is being promoted through print, outdoor and radio ads as well. The article was originally published in Afaqs. Copyright © Lowe Lintas 2019.